The big news this weekend is the return of CicLAvia to Culver City and Venice, and points in between. 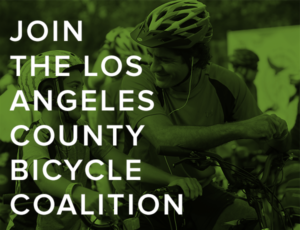 CicLAvia lists feeder rides, including a chance to ride with the mayor of Santa Monica. Meanwhile, Metro offers advice on how to get there via the Expo Line, which is by far your best bet if you can’t ride there. CicLAvia also offer an interactive map of highlights along the route. And no CicLAvia is complete without the Militant Angeleno’s epic guide. It was only seven short years ago that cyclists started seriously pressing Malibu officials to make much needed changes on deadly PCH through the city. 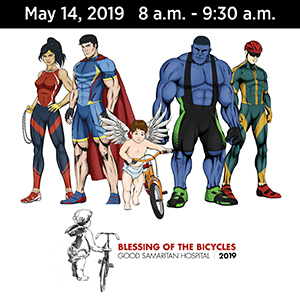 Efforts that at first seemed to go nowhere in what was then a very bike-unfriendly city, but gradually led to significant improvements as they recognized both the value of bicyclists and the need to make the city’s de facto Main Street safer for everyone. A change for which Eric Bruins, now the Bicycle and Pedestrian Coordinator for Culver City, deserves the lion’s share of the credit. Now those efforts appear to be bearing fruit, as many of the suggestions made by cyclists in those meetings — like narrowing traffic lanes to slow drivers, installing bike lanes and widening shoulders to reduce the risk of dooring from parked cars — are contained in a new PCH Parking Study commissioned by the city. According to the Malibu Times, the study calls for making traffic lanes, which are currently anywhere from 14 to 16 feet wide, a uniform 11 feet throughout the 22-mile length of the highway through the ‘Bu. It also calls for bike lanes, which city officials had rejected out of hand back in the bad old days, on PCH west of Trancas. And from Webb Way to Las Flores Canyon, stretching 3.3 miles from just beyond the Country Mart to a little before Pepperdine University. However, it’s not a done deal. Malibu is holding a special joint meeting of the Public Safety and Public Works Commissions this Wednesday to discuss the study. And it’s sure to be filled with the usual anti-bike forces who don’t want any changes to accommodate bikes, as well as residents who are willing to keep PCH dangerous if it means they can keep their parking spaces. So if you ride PCH through the city — or would like to — make plans to be there, from 6:30 pm to 8:30 pm at Malibu City Hall, 23825 Stuart Ranch Road. It’s been awhile since we’ve heard from LA Bike Dad. Now we know why, as he relates the harrowing tale of his wife’s emergency C-section and his son’s premature birth. Best wishes to him and his family, and congratulations on a healthy baby boy. And let’s offer a word of thanks that everyone is okay. LA’s $5.5 billion plan to reduce auto traffic at LAX includes improvements in bike and pedestrian access. Rapha is planning a series of weekend rides and parties in cities around the world; they’ll come to Los Angeles in July. The mayor of Santa Clarita makes a call for residents to complete a short five-question survey about the city’s proposed bikeshare system before the end of the month. Don’t plan on riding the bike path at Bolsa Chica State Beach this Saturday, unless you want to find yourself in the middle of a pro-Trump rally. A Salinas writer says bikeshare has been a huge success in SoCal, so why not there? A bike-hating Vallejo letter writer blames bicyclists for just about everything, from running into car doors to riding outside the door zone. The only thing she seems to have left out is colluding with the Russians to put bike lanes on our streets. A writer for Road and Track makes a surprising call to bring back red light cameras — not to raise revenue for cities, but to actually improve safety for everyone on the streets. Tucson concludes that painted bike lanes aren’t enough for riders of all ages. A Seattle-area bicyclist complains about the insensitivity of drivers who refuse to pass safely. A Boston reverend says she found a new spirituality and sense of community bicycling through the city’s traffic clogged streets. New York delivery cyclists speak out about what the Village Voice calls the toughest job on two wheels. New Orleans plans to double bicycling rates over the next three years as part of the PeopleForBikes Big Jump Project. Los Angeles is also one of the ten cities participating in the project, with plans to boost cycling rates in DTLA and University Park. Grab another cup of joe; a new books says for most people, coffee isn’t just not harmful, it’s actually good for you. Seriously? A British lord blamed the bike lanes on London’s Westminster bridge for making it easier for a terrorist to run down dozens of people in Wednesday’s attack. As if it would have been harder for him to drive down the sidewalk if the traffic lanes butted up against the curb, instead. A physician who used to live in Visalia got caught up in the attack as he was bicycling across the Westminster Bridge, and rushed to help the victims before the paramedics arrived. A British bike industry association is staring a new campaign to get more children to start cycling. Officials in an English town remind angry drivers that bicyclists aren’t required to use a new network of bikeways, and there are good reasons why they might choose to ride in the road instead. Now that I’d like to see. Danish ebike maker Diavelo will unveil a new model at the Taipei Cycle Show designed by famed auto design firm Pininfarina, the company responsible for classic cars from Ferrari, Fiat, Alpha Romeo and Maserati. Drivers aren’t always the bad guys. A South African motorist came to the aid of a woman who had been pulled off her bicycle and dragged down some stairs by a pair of robbers; they bolted when he ran to help. If you’re going to hitch your dog to a bike rack, make sure it’s bolted down first; same advice holds for your bike, too. Maybe you’re in the market for a slightly used 24K gold BMX bike for a mere fifty grand. And usually the douchebags are behind the wheel, not protecting the bikes. 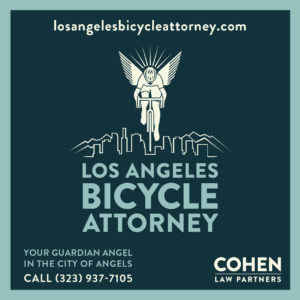 Don’t miss ciclavia this sunday. It’s the best one. What Malibu needs to do is to encourage cyclists to follow the lead of Big Orange. 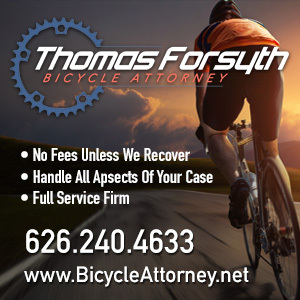 Encourage cyclists on PCH to take the full lane, riddle PCH with “Bikes May Use Full Lane” signs, and require the LASD to accept video evidence from harassed cyclists to prosecute motorists. What PCH does not need is a wedged-in suicide slot that will result in more accidents due to doorings, turning conflicts, distracted drivers trying to park or pull out into traffic, and distracted beach goers loading and unloading surfboards, kids, and beach paraphernalia. I might agree with you if the speed limit was 25 mph or less, and strictly enforced. But as long as speeding drivers travel at highway speeds, taking the lane will only be an option for the most skilled and confident riders, rather than the overwhelming majority of bike riders and would-be riders. As for that “wedged-in suicide slot,” every study I’ve seen shows that bike lanes improve safety compared to streets with no bike infrastructure. It’s up to us to ensure that they are well-designed and don’t put riders in conflict areas.